It was in the picturesque little town of Sintra, just outside of Lisbon, that for the umpteenth time, this proved to the be the case. A friend and I were a perusing the menu at Estrada Velha, a small bar along the main tourist-packed road, wondering if the shop owner who’d given us the recommendation had steered us wrong, when amidst the sandwiches and salads, I saw something that caught my eye: a francesinha. A sandwich originally from Porto, on Portugal’s northern coast, a francesinha is basically a Portuguese spin on a croque madame or croque monsieur (madame being with a fried egg, monsieur without, though the francesinha doesn’t have different names for this.) Instead of ham and béchamel sauce, the francesinha, has different kinds of meat inside. The one I had in Sintra had thin slices of salami, roast pork and ham, and instead of béchamel, there was a layer of gooey melted cheese. Plopped right on top? My favorite and yours (or possibly just mine), a fried egg. 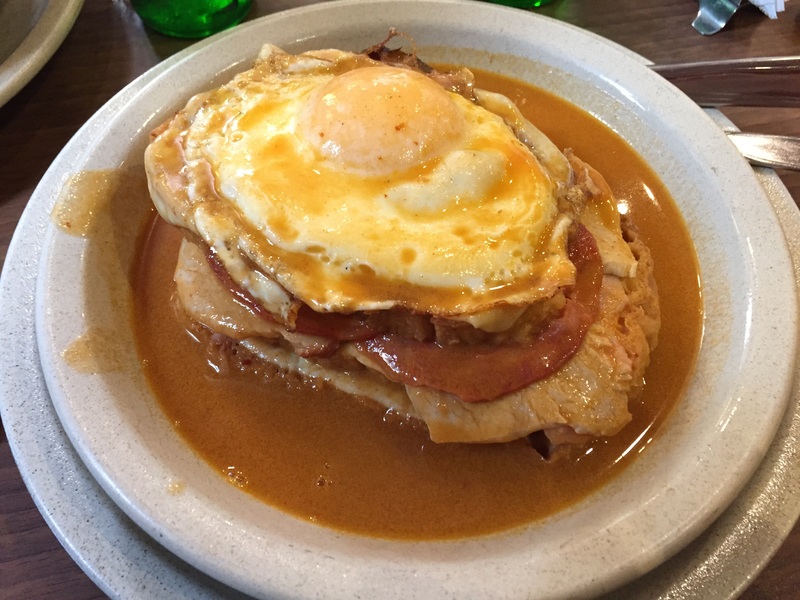 Finally, taking one step farther away from the croque madame/monsieur, the francesinha came in a shallow pool of a slightly spicy, sauce, almost like a tomato soup. The whole thing was a saucy, sloppy, wet, delicious mess best attacked with a fork and knife. The sauce, really more of a tomato and beer broth, was perfect for soaking the bread in, softening everything and blending the flavors. I’ve always loved a good croque madame but I think I just might like this Portuguese francesinha a bit more. Maybe my universal truth about fried eggs needs to also include a good sauce.